This rack is an excellent lab apparatus compatible with different sizes of tubes. Four sides of this rack can be used for tubes of ø30mm, ø20mm, ø17mm & ø12mm. Replacement for wood and metal racks. For six test tubes. Has six openings of 25mm diameter on top plate, with hemispherical wells and drying pins. Open side for clear viewing. Dimensions: (I x w x h), 240 x 70 x 90mm. Conical Centrifuge Tube Rack, Autoclavable, Pack of 2 Pcs. Conical Centrifuge Tube Rack, Pack of 2 Pcs. Description: Well for 15 ml. tubes measures 17 mm dia., Well for 50 ml. tube measures 28 mm dia. 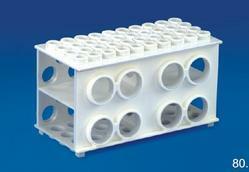 With the assistance of our talented team of professionals, we are providing a high quality range of Cuvette Rack. Backed by years of industry experience, we are engaged in offering a premium quality range of Test Tube Rack. This rack, as the name suggests, is used for keeping PCR Tubes. Top & base of this rack are made of tough & transparent polycarbonate while the middle portion is made of polypropylene.The tube holding spaces are uniformly placed so as to facilitate the use of multipipettes.A no.of racks can be stacked together to save shelf space. 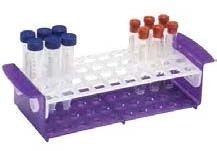 Test Tube Rack Universal Multi RackThis rack is an excellent lab apparatus compatible with different sizes of tubes. Four sides of this rack can be used for tubes of φ30mm, φ20mm, φ17mm & φ12mm. These racks can conveniently hold inverted tubes for drying purpose and minimizes collection of airborne contaminants inside the tube. This rack can also be used to hook and dry electrophoresis and chromatography plates. Well-constructed wood test tube support. Holds 12 test tubes up to 22mm in diameter. Includes two shelves and drying pins. Universal Combi Rack System is designed to support a variety of tube size. The rack may be rotated to any of the four position & have the following diameters of tubes. Available in single, double and triple tier.